Tsui Wah is the largest and most famous cha chaan teng chain in Hong Kong. They have 35 branches in Hong Kong, 2 branches in Macau and 22 branches in mainland China. They are so big that their holding company Tsui Holdings Limited is listed publicly on the Hong Kong Stock Exchange. Their most famous outlet is at Wellington St, where late night clubbers at Lan Kwai Fong would drop by for supper after a long night partying. This is a review of the Tsui Wah cha chaan teng branch at Jordan, Hong Kong. If you are looking for our review of their Singapore branch at Clarke Quay, click here. Our Hong Kong trip itinerary was too full to allow for a time slot to visit Tsui Wah. Fortunately or unfortunately, the 9am ferry to Macau that we had intended to book was full, so we had to settle for the earlier 8am one. Consequently we needed a breakfast place that opened super early, say at 6am. This severely limited our options as some of the famous cha chaan tengs in the area did not open so early – i.e. Australia Dairy Company opens only at 7:30am. Tsui Wah to the rescue. Their Parkes St outlet at Jordan is opened 24 hours a day, so we slotted it into our schedule. As we were there at around 6am, most of the food in the top 10 list was inappropriate, so we settled for their breakfast items instead, which still had two items in their top 10 list. At that timing on a weekday, the place was half-empty and consequently we did not experience any bad service or impatience from the staff there. Given their breakfast set options, we settled for one Set B each plus one of their condensed milk crispy buns that was in their top 10 list. Their breakfast Set B consisted of scrambled eggs, a crispy bun with butter, satay beef instant noodles and hot coffee or milk tea. We weren’t really in the mood for macaroni or ‘preserved vegetable with vermicelli in soup’. 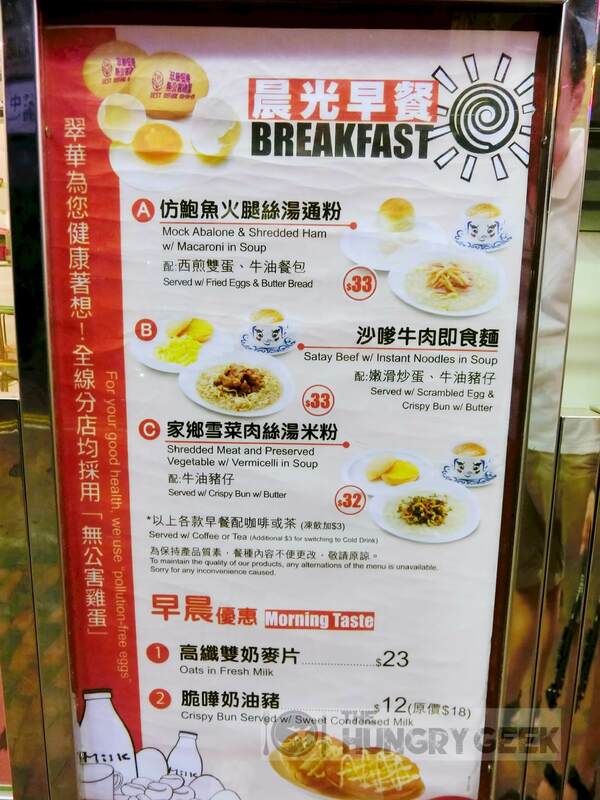 Each breakfast set costs HK$33, and the condensed milk crispy bun costs HK$12. You will have to pay an extra HK$3 if you prefer a cold drink instead. The scrambled eggs came piping hot and they were really nice and runny. It is soft and really melts in your mouth. However as we had been spoilt with fantastic scrambled eggs from Australia Dairy Company and Capital Cafe, we must say that the scrambled eggs at Tsui Wah is a bit behind. We still rate is a solid 4/5. The ‘crispy bun with butter’ on the other hand, was a bit plain as there wasn’t enough butter and it simply wasn’t crispy enough. Looks can be deceiving. It looks super delicious and sinfully tasty right? It actually wasn’t very good. The ‘satay beef’ tasted flat and even the instant noodles didn’t provide the usual kick from the MSG laden seasoning. Perhaps the restaurant has decided to eschew MSG and/or instant noodles seasoning for health reasons. We rate that item 3/5. The satay beef instant noodles at Sun Wah Cafe was much better. This is one of the items in Tsui Wah’s top 10 list, and we were really anticipating it. We had just tasted Capital Cafe’s version of it the day before and it was in our top 5 food experiences in Hong Kong. How would Tsui Wah’s rendition compare? Tsui Wah’s condensed milk bun tasted very similar to the condensed milk bun that we tried on our second visit to Capital Cafe. If you had missed our review of Capital Cafe, the condensed milk bun was one of the best items that we ever tasted on our first visit, but the standard dropped considerably on our second visit due to a sub-optimum level of crispiness. Tsui Wah’s condensed milk bun was similar. The taste combination of the sweet condensed milk and the fragrant crispy bun was fantastic, but the weak crispiness was a serious let down. Nonetheless we rate this item 4/5. This was pretty good! As with the famous cha chaan tengs in Hong Kong, there is always an over-abundance of tea fragrance coupled with an ample amount of milk. While this was pretty good, we found Capital Cafe’s milk tea slightly better and Lan Fong Yuen’s milk tea some miles away. We rate Tsui Wah’s milk tea 4/5. That is how the outside of the Tsui Wah outlet at Parkes St, Kowloon Hong Kong looks at 6:25am in the morning. It is not a pleasant sight and it is a bit scary. Yet at the same time you will be able to find an air conditioned cha chaan teng that is run by a listed company selling pretty solid food. This is the irresistible contradiction of Hong Kong that will make you fall in love with the place. Tsui Wah is a decent place for food, and if you find yourself hungry during the wee hours of the morning, it is a perfect option. However, there may be better options available during the day. That said, we did not have the opportunity to try Tsui Wah’s famous branch at Wellington St which was closed for renovations when we were there. They have many other outlets all around Hong Kong, Macau and mainland China. Kam Wah Cafe 金華冰廳 – Polo Bun, Egg Tarts & Milk Tea In "Hong Kong Cha Chaan Teng"